Naples is part of Florida’s Paradise Coast, so you know you’ll have the ultimate tropical vacation in Naples. Enjoy the best mix of sophistication and nature. For high-end shopping, try the boutiques and retailers of Fifth Avenue South, the Waterside Shops and nearby outlet stores. There are tons of wonderful restaurants in Naples for all tastes and budget types. If you’re looking to save money but enjoy delicious local food, check out our list of cheap restaurants in Naples! Whether you’re relaxing by the pool of your Naples hotel, or one of the many picturesque beaches on the Gulf of Mexico, you’re sure to find the rest and relaxation you deserve. From historic homes to popular attractions, Naples has much to offer. Consider a trip to Naples Zoo at Caribbean Gardens, Golisano Children’s Museum of Naples, Fun-n-Sun Lagoon, and more (see our list of free things to do in Naples below). 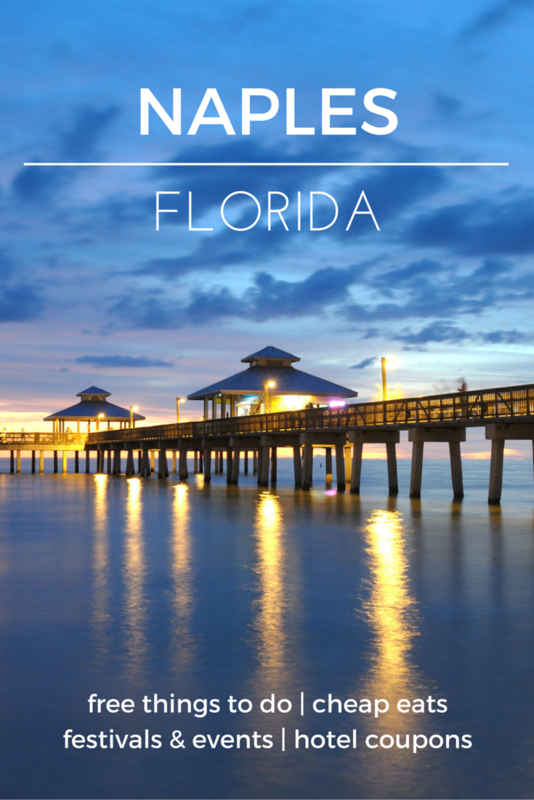 The gorgeous beaches of Naples, Florida are on Florida’s Gulf Coast. That means you’ll enjoy crystal-clear waters, white sandy beaches and a nice ocean breeze. Big Cypress National Preserve is free to visit. It’s next to the Everglades, but closer to Naples, so it’s a great place to visit even if you don’t have much time. This beachfront park offers picnic facilities, a playground and more. Lowdermilk Park may get busy since it’s in a great location along Gulf Shore Boulevard. From the forest to the dunes to the beach, Clam Pass County Park offers a truly authentic Florida experience. Perfect for families, couples or independent travelers, add Clam Pass to your itinerary. Learn about the prehistory of Florida at Collier County Museum. You’ll learn all about the Native Americans and settlers that lived in this area hundreds of years ago. Although it’s about 40 minutes outside of Naples, it’s worth a trip to visit the free Museum of the Everglades. Within this historic building you’ll learn about the history of the Everglades. Head to the Seaboard Air Line Railway station for a look into the history of transportation in Naples. Discover the history of the Calusa Native Americans at the Marco Island Historical Museum. Ideal for fishing or simply watching the sunset, Naples City Pier is free to visit. You won’t believe the views from this historic pier in Naples. Located near Fifth Avenue South, the Naples National Art Festival brings together artists from across the U.S. to display and sell their masterpieces. Find paintings, pottery, photography and more. This free event offers smooth blues music played live, plus food and beverage vendors from all over Naples. The Mercato Fine Arts Festival is held annually at Mercato shopping area in Naples, Florida. This free event makes it easy to select the perfect pieces for your home. If you think mastering the perfect pint is an art, then mark your calendar for the Naples Craft Beer Festival. The event is held on the Naples Bayfront. Head to Fifth Avenue South for the annual Naples Festival of the Arts. You’ll enjoy more than 200 displays of arts and crafts. Between the fresh seafood and the live music, there’s no better time to visit the Naples area. Don’t miss the Marco Island Seafood & Music Festival. Watch the red, white and blue parade through Naples, then head to the Naples Pier for 4th of July fireworks! Film enthusiasts and professionals like will appreciate the Naples International Film Festival. Feel the holiday cheer as lighted boats from the MIACC parade through Naples Bay. View the Naples Christmas Boat Parade from Bayview Park, Naples Landing, Naples City Dock, and more. On the last two days of the year, celebrate with the New Year’s Eve Art Fair happening in Downtown Naples on Fifth Avenue South. Enjoy and purchase art from local artists.